2019 BMW 330e Plug-in Hybrid PHEV review - prices, specs and release date | What Car? 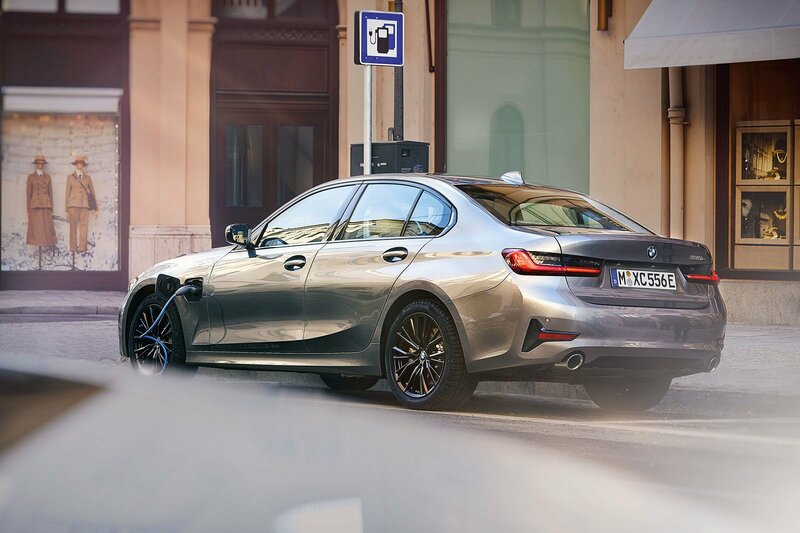 Any lingering doubts that hybrid technology is ready for use in serious mainstream models from manufacturers who put a high value on the enjoyment of driving, were surely put to bed by the previous generation BMW 3 Series. The 330e — a plug-in hybrid that paired its four-cylinder petrol engine with a small electric motor – was not only athletic to drive but clever, too, switching between its two power sources almost seamlessly. You could drive it for more than 20 silent miles if the battery was fully charged, and its carbon dioxide (CO2) emissions were supremely low given the strong performance on offer. Perhaps it isn’t surprising that the model proved hugely popular as a company car — one in every three 3 Series sold in Europe had ‘330e’ on its bootlid – only the stalwart 320d sold in bigger numbers. That was only the beginning of the story for plug-in hybrid versions of BMW’s popular executive saloon, though. Based on the current 3 Series, the latest 330e could very well become the best seller of the line-up. Why? Because with more battery capacity its electric range has grown to a claimed 37 miles and its official combined fuel economy figure has risen to 138mpg on the WLTP cycle. Most important for company car drivers are its CO2 emissions figure of just 39g/km, which promises ultra-competitive benefit-in-kind tax and toll-free access to low-emissions zones, such as the London Congestion Zone. How much will all this cost? Around £38,000, which is roughly the same as the conventional 330i. 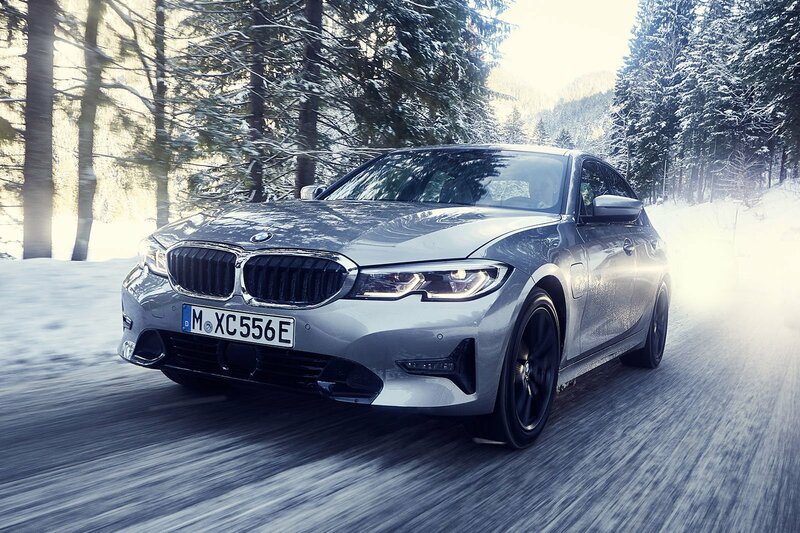 You will have to wait until July this year before the 330e goes on sale, though, and slightly longer before you can buy an xDrive four-wheel drive version — at first it will be available in rear-wheel-drive form only. Our short test drive in a late prototype 330e highlighted just what a convincing package it's set to be. 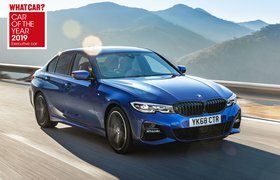 Because it has to cope with an extra 200kg of weight from the battery pack and electric motor, its suspension is a touch firmer than our current Executive Car of the Year, the BMW 320d, but the effect this has on ride is marginal. The 330e is still pliant at speed, while body control remains a step above what you’ll get in a Mercedes C-Class or Audi A4. The steering is also a highlight for keen drivers, being quick to respond and laced with greater ‘feel’ than rivals to tell you how firm a grip the front tyres have on the road. As for performance, the 330e hits 0-62mph in six seconds, helped by a new ‘XtraBoost’ function that delivers an additional hit of power from the electric motor in Sport mode. That's performance enough to match the 330i, but it’s the manner in which this car delivers its 249bhp (rising to 289bhp with XtraBoost) that impresses most. In the default Hybrid setting, the car pulls away under electric power but blends that with the petrol engine's output when necessary. That it does this so smoothly, without any juddering or hesitation, is a highlight of the driving experience; one that the smooth-spinning petrol engine and slick, quick eight-speed automatic gearbox also add to. It’s also possible to drive the 330e purely as an electric car, a feat achieved by pressing the button marked ‘Electric’ on the centre-console. With just 68bhp from the electric motor alone, progress is steady but adequate for urban pottering. However, whenever you need to make a sudden getaway, you can bring in the petrol engine with a stamp on the accelerator to engage kick-down, just like you would with a regular automatic car. On the other hand, if you want to reserve battery power for later on in a journey, you do can do so by selecting a different mode and relying solely on the engine. Even in this, its least fuel-efficient mode, we still managed to return close to 50mpg at a motorway cruise. The 3 Series is a model of 'how to do an executive car'. Its dashboard is well laid out and the arrangement and range of adjustments for its seat and steering wheel are superb (bar the slightly offset pedals). Then there’s its interior quality, which is second only to the high bar set by the Audi A4 saloon. Exact specifications are yet to be confirmed, but the 330e will get Parking Assistant as standard (to search for and steer you into a parking space) along with the facility to remotely pre-precondition its interior, so it can be toasty when you jump in during winter and nicely chilled in the summer. 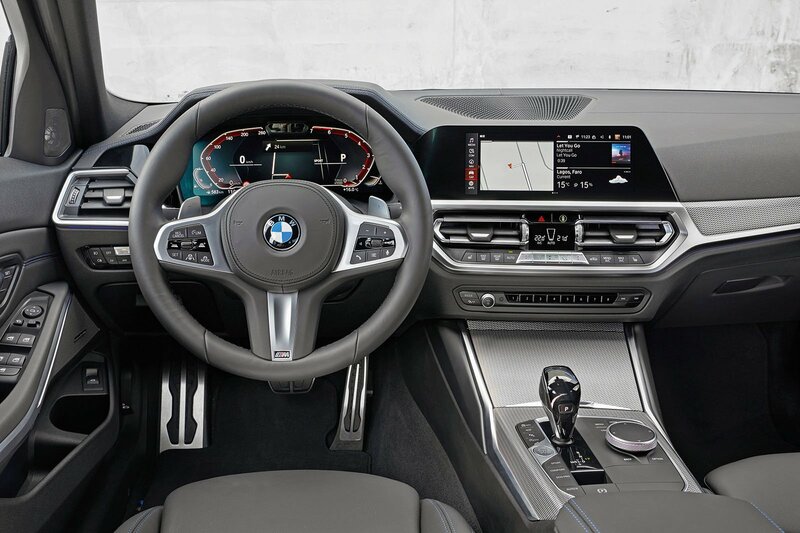 M Sport trim cars are expected to get BMW’s frankly brilliant infotainment system with a bigger 10.3in central touchscreen, with lesser variants using an 8.8in alternative. Both will use the latest-generation of digital instruments, which for the 330e feature crisp, blue graphics — instead of the regular 3 Series’ orange — to display battery charge and efficiency. Passenger space for four adults generous: just as good as any other current 3 Series. The only significant drawback to the 330e proposition is its boot space — the battery pack robs roughly 100 litres from its overall capacity. For our detailed review telling you all about the practicalities of 3 Series ownership, head to our full review, here.